Click here for a listing of guides and outfitters rafting the Sauk River. 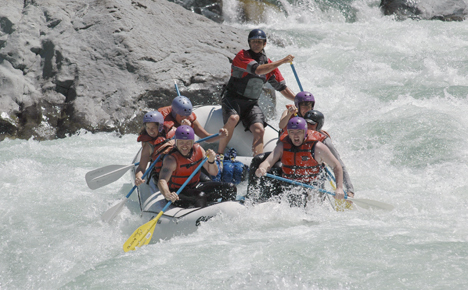 The Sauk River is the best kept whitewater and scenic rafting trip secret in the Cascades. Tumbling out of the pristine Glacier Peak Wilderness, the clear, free-flowing Sauk River is considered by whitewater kayakers to have some of the finest "play" waves in the state of Washington. The Forest Service only allows four whitewater outfitters to provide river trips on the Sauk River and Orion is proud to say that we are one of them. Therefore, when you raft the Sauk River, you are one of only several hundred who are able to float the river for the season. And, chances are, you and your crew mates will have the whole Class III-IV federally designated Wild & Scenic river to yourselves. *The river description above courtesy of Orion Expeditions, Inc.